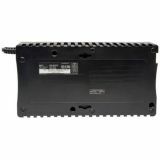 Offers complete protection from blackouts, brownouts and surges on both AC and TEL/DSL line connections. 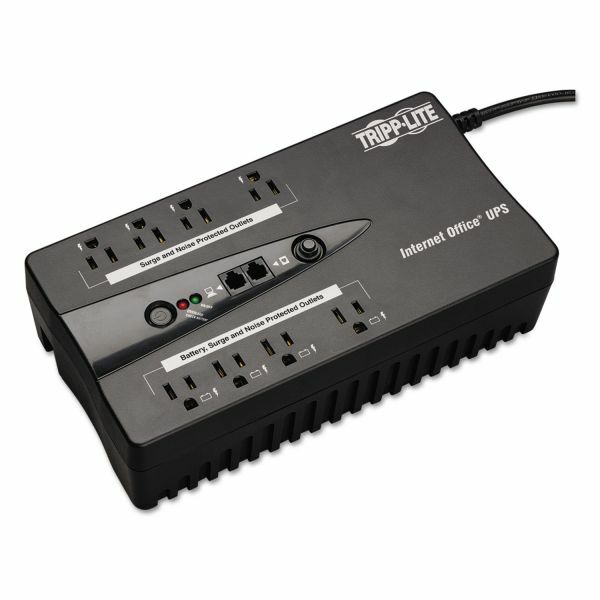 Six widely spaced outlets accommodate large transformer plugs without blocking outlets. The USB interface connects to a computer for power management and automatic file saves. The ultra-compact, low-profile case saves space and supports desk, floor or wall-mount placement. Tripp Lite Internet Office Ultra-Compact Desktop Standby UPS, USB, 8 Outlets, 550 VA, 420 J - Use Internet Office UPS to stay connected to the Internet and work through short blackouts with phone/modem/DSL protection, a USB port and PowerAlert Software (website download). 1-RJ11 and 1 USB port protection. Built-in audible alarm and front panel LEDs offer continuous status information regarding line and battery power operation. Basic PCs for home / home-office use, network workstations, audio/video equipment, home entertainment systems and other sensitive electronic devices. Run Time based on single PC load with 15" flat panel monitor.